The main reason why people get pick-up trucks is to be able to carry around heavy cargo conveniently. So there clearly has to be a way of protecting that cargo so it doesn’t get damaged by exposure to the elements. A tonneau cover is great for protecting the cargo in your pickup truck. If you're transporting something that absolutely must be kept dry, they can provide a waterproof seal, and also protect against damage from sunlight. You probably would also like to prevent someone from stealing whatever cargo you're carrying--so it has to be secure as well.There are a number of designs and materials—they have to be lightweight so that you don't need help to open them up or attach them. But at the same time, they have to keep the truck bed secure. Tonneau covers will either be hard or soft: hard covers can be made of vinyl covered ABS plastic, and usually fold up. Hard covers can be either retractable, folding, or hinged. But then there are soft covers, which you can roll up in order to gain access to your cargo. You’ll find soft covers that are either roll-up, snap style, or snapless. There are two major subdivisions of tonneau covers: hard covers, and soft covers. The hard covers tend to be more expensive, while the soft covers are easier to open and close. Hard Covers: Hard tonneau covers can be made of ABS plastic, aluminum, or fiberglass. The hardcover is strong enough to support a person's weight--people can even sit on the cover! They also lock your belongings in the truck bed so that they are secure. They offer a watertight seal.They can either be retractable, folding, or hinged. Retractable Covers: Retractable tonneau covers are made from slats of rigid aluminum, or vinyl- or felt-covered aluminum, that can be drawn back into a spring-loaded canister. They are secure, but the canister occupies part of the truck bed, so you end up around 9” of space. When you want to cover the truck bed, there is a pull string that draws out the tonneau cover. These offer the maximum in security and keeping the truck bed watertight. But the price reflects that: they will typically be over $1000. BAK Retractable tonneau covers are all felt-line--so that there is a minimum of noise from the cover impacting the railing when driving. Folding Covers: This can be from vinyl, plastic or aluminum. They can be made of three or four pieces that you fold from the tail of the car towards the front. If you need some more space, you fold it up some more. Once you fold the cover, you can secure it in place. That will allow you room for transporting big objects in the truck. These covers lock in place and are harder than the roll-up type. There are also tri-fold tonneau covers, that fold in two places. An example is the Extang 62450 Encore Tri-fold Tonneau Cover, which features 1-inch thick aluminum sheets to it tonneau cover. 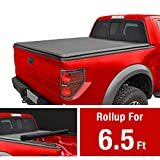 Another recommended version is the BAK 26406 BakFlip G2 Toyota Tacoma Truck Bed Cover, which folds entirely towards the truck’s rear window. It is also easy to remove the BAK tonneau cover--it weighs only 40 pounds. Hinged: This type lifts up and is held in place by a support (sort of how you lift up the hood of your car). The Extang Full-Tilt Tonneau Cover is a type of hinged cover, that you can prop up with a strut. But it also allows you to roll it up or remove it entirely. You can find these in remote-control or automatic versions, where the hinge lifts up with the push of a button on your dashboard or a remote control connected to an actuator. Soft Covers: These are tonneau covers that can be rolled up when you want to uncover the truck bed. Common materials will be vinyl, such as the Agri-Cover or TruXedo Tonneau Covers. Snap-Style: These consist of a soft vinyl cover tarp with snaps. The snaps attach to a metal frame that you clamp onto the truck bed. One example is the Sure Fit Tonneau Cover, which you can find for as little as $230. Snapless: There is also a snapless version, where the vinyl tarp attaches to the metal frame by means of Velcro strips. The frame and the tarp are on a hinge and can be propped up in place. 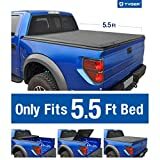 These are the least expensive types of tonneau covers--but they will not offer the strength and waterproof features of the hard tonneau covers. Toolbox tonneau: If you have a truck toolbox in your pickup truck, there are tonneau covers that can accommodate the toolbox, to protect it from the weather and from theft. Materials: There are hard covers that are made from polypropylene, which gives them strength and heat resistance. There are also covers made from aluminum or fiberglass. If you're interested in the vinyl tarp cover, make sure that it's sturdy and tear-resistant. The Tonno Pro 42-305 Tonno Fold Black Tri-fold Truck Tonneau Cover is sewn in a special manner, for greater durability. The vinyl cover is stitched with 4 stitches per inch by means of specially coated thread that expands to fit the needle-hole and prevents moisture from getting into the truck bed. Assembly: Take note of the assembly instructions for the tonneau. Most manufacturers try to make their tonneau cover as easy to install as possible—installation should take no more than 20 minutes! On the other hand, some require you to drill on snaps in order to secure it in place. Some people also said that the cover didn't fit their pickup truck 100%--it's important to verify the right dimensions before purchasing. Installing a rack as well: Bak also features retractable tonneau covers with rack uprights that you attach to the tonneau cover rails. Besides having secure storage in the pickup’s truck bed, you can also store cargo on the rack, such as a canoe, bicycles, or surfboards. Warranty: Some of the tonneau cover companies offer a warranty on their products. For example, the Agri-Cover Access tonneau covers are covered by a limited lifetime warranty. However, some of the soft vinyl covers will have a warranty on the aluminum frame, but not on the vinyl cover itself, which understandably can start to tear over time. 1. Place the left-side rail on the driver's (left) side, with the mylar bracket toward the rear of the truck. 2. Place the right-side rail on the passenger (right) side. 3. Take 4 clamps from the hardware bag for each side rail (you might not need the fourth clamp if your tonneau bed isn't very long). 4. Slide the left-side rail on the left side of the truck bed wall. The spring clamp holds the rail in the proper position (temporarily). 5. Attaching clamps: Place the first clamp 8" from the front of the box, tighten with a wrench, making sure that the clamp is level. Place the 2nd clamp 10" away from the first clamp. Install a 3rd clamp 8" from the back of the truck, and the 4th clamp 10" away from the 3rd clamp. 6. Repeat the same procedure of attaching clamps on the right-side rail. 7. Attach the rubber sealing strip on the front of the truck bed. 8. Attach the two straps to the tonneau cover, and attach the tension adjusters. These tension adjusters will ensure that the tonneau cover’s fit is tight, even if there are drastic changes in temperature.There is a tension adjuster for the left side and one for the right side, which are specially tuned for each truck type. 10. You can spread the tonneau cover over the rails, and snap it in place on the truck bed’s tailgate. Tension adjuster: Those companies that advertise a tension adjuster which keeps the roll-up tonneau cover taut over the truck bed also require that you keep the tension equal on both sides: make sure that the tension on the right equals that on the left. Matches the truck's bed and tailgate caps: Some covers are made to match the truck's railing, to make it look like the cover came from the truck's manufacturer. Tailgate seal: There should be a means of attaching your cover to the tailgate (the back part of the truck bed, that drops down when you want to load up your truck). This helps your tonneau cover protect the cargo. Required tools: The Agri-Covers various roll-up covers come with 2 9/16" wrenches, by means of which you attach the various bolts for the tonneau cover’s runners. (It is possible to use a power wrench, for faster results). There are no other tools that are required, even though the manufacturer suggests using a spring clamp for holding the rails in place before securing them with bolts. Increased gas savings: Most manufacturers note that attaching a tonneau cover will make the truck more aerodynamically efficient. The air moves over the truck, causing less drag and air resistance. They estimate a 10-15% savings on gasoline when traveling with a tonneau cover. Tyger Auto—are manufacturers of aftermarket auto parts. They make accessories such as body trim, fender flares, grill guards, running boards, as well as tonneau covers. Lund-- was founded in 1965 and is located in Buford, Georgia. They make automotive accessories that are both functional and stylish. Their products are used in trucks, vans and passenger cars. TruXedo—are located in Yankton, South Dakota. They were founded in the year 2000. 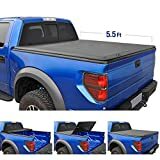 They have a large number of styles of tonneau covers for pickup trucks. Extang—are engineers and manufacturers of tonneau covers. They founded their company in 1982, and are based in Ann Arbor, Michigan. They make tonneaus in a variety of styles: folding, roll-up, snap-on, and more.